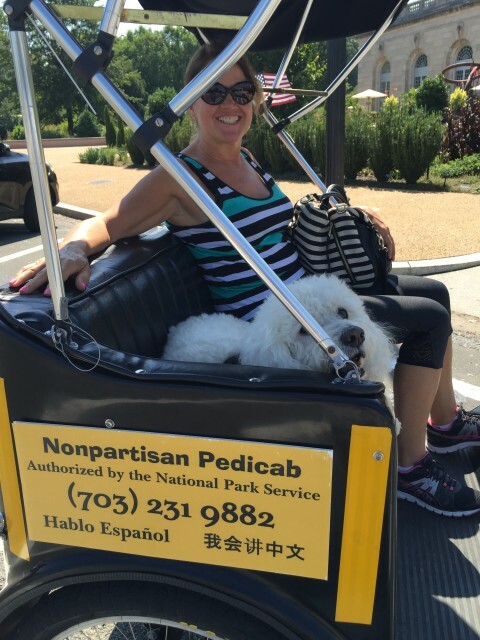 Washington DC has so many things for the visitor to see. 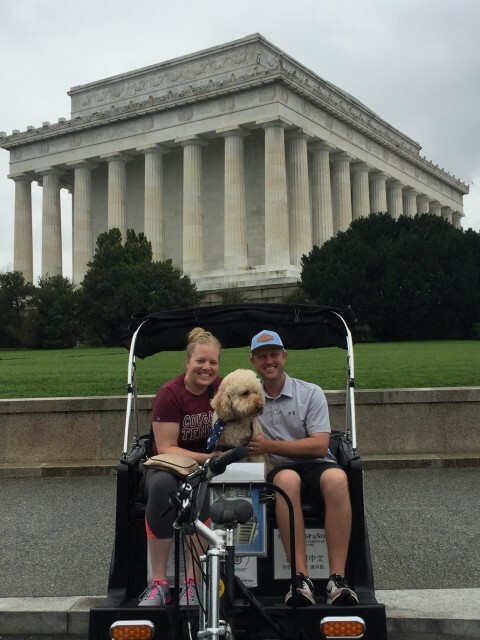 You can visit the National Mall and see all the spectacular memorials. You can visit the magnificent Smithsonian Museums. You can see the great buildings of our national government including the White House, the US Capitol and the enormous government departments that line Pennsylvania Avenue. 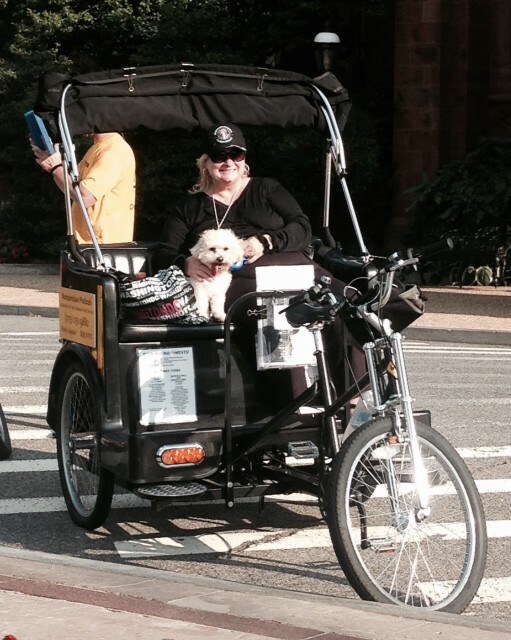 You can also see the historic neighborhoods of Embassy Row, Dupont Circle and Georgetown. The best thing is that all of these attractions are absolutely free! 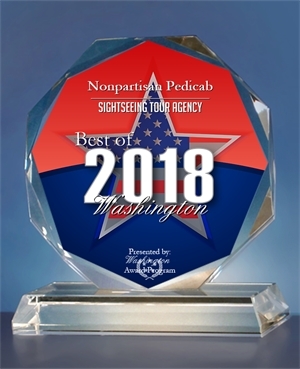 The National Mall and the memorials are at the top of the list for places to see in Washington DC. 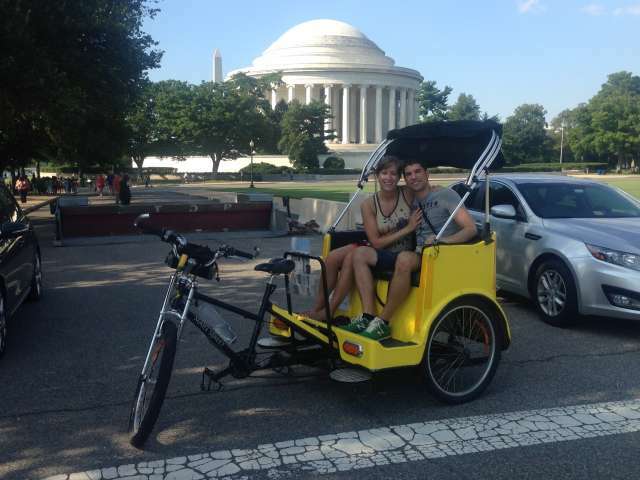 The National Mall is a national park that extends 2.5 miles from the steps of the US Capitol to the Lincoln Memorial. In one half of this park, you will find numerous Smithsonian Museums. 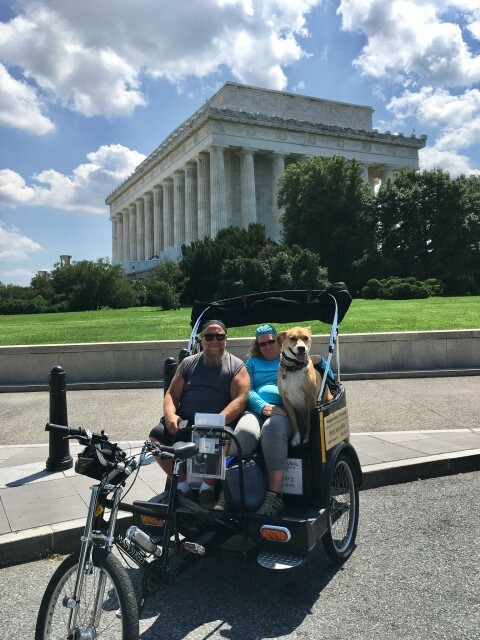 At the other end, you will find all the national monuments and memorials like the Washington Monument, the Lincoln Memorial, the Jefferson Memorial, the MLK Memorial, the Franklin Roosevelt Memorial, the WWII Memorial, the Korean War Memorial, and the Vietnam War Memorial. All of the memorials are free to the public and open 24 hours a day, 365 days a year. They are spread out, so visiting all of them on foot on a single day is quite an endeavor. Abraham Lincoln is known as the preserver of the nation due to his iron will in keeping the country together during the Civil War. 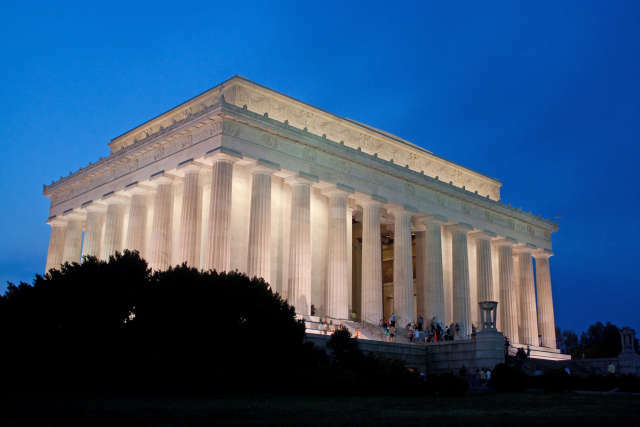 Many people consider the Lincoln Memorial to be the crown jewel of the National Mall. From the steps of the Lincoln Memorial, you get a grand vista of the entire National Mall. If you only visit one memorial, this is probably the one to go to. In the evening, the Lincoln Memorial is lit up spectacularly. 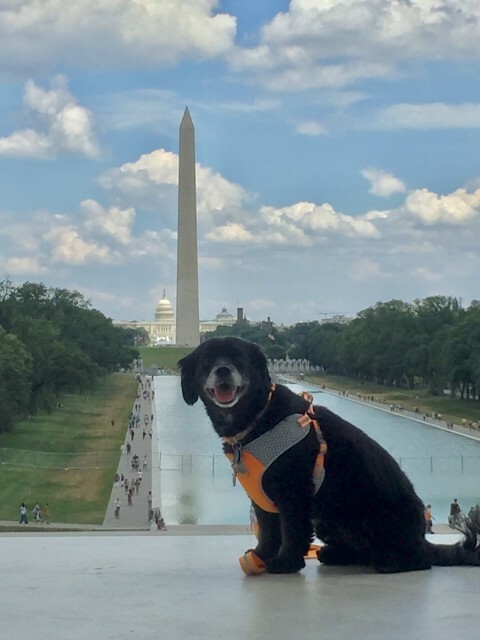 The Reflecting Pool that you see from the steps of the Lincoln Memorial reflects the Washington Monument and the US Capitol. "First in war. First in peace. First in the hearts of his countrymen." George Washington was the commanding general during the Revolutionary War, presided over the Constitutional Convention in 1787, and became the first president of the United States. His monument stands right in the center of the National Mall overlooking the entire city. Currently under renovation, but expected to re-open to the public in 2019, the Washington Monument has an observation deck open to the public. Even if you don't go to the top, the construction is magnificent and visible from anywhere in the city. The Jefferson Memorial celebrates the author of the Declaration of Independence and the third president of the United States. This monument overlooks the Tidal Basin and is the center of attention during the Cherry Blossom Festival. 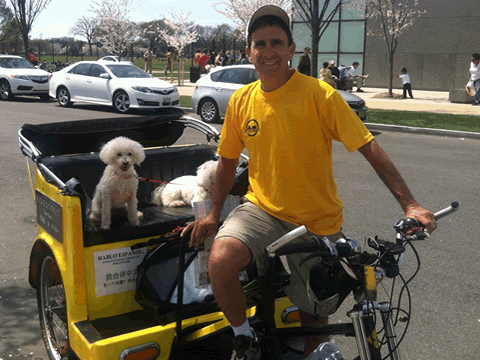 From the plaza in front of the memorial, the visitor gets a tremendous view of all the cherry trees in bloom. The Jefferson Memorial is often one that is missed by visitors who choose to walk the National Mall on foot because it requires a detour around the Tidal Basin. This monument is particularly poignant at twilight. 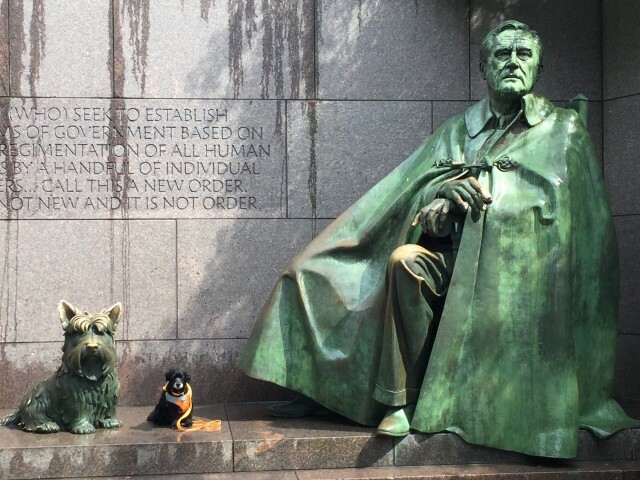 The FDR Memorial celebrates our 32nd president. He guided America through the Great Depression and then through the Second World War. It is quite different from the imposing marble temples dedicated to Lincoln and Jefferson. Instead, the FDR Memorial is low to the ground and is composed of 4 open air rooms. Each room represents one of the 4 terms that FDR was elected to be president. Each room has three elements. There are statures and quotes. And, a running water element flows throughout the memorial. 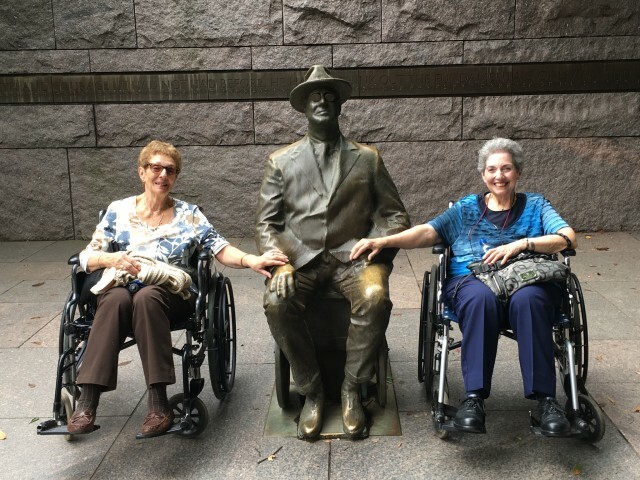 Many visitors find the FDR Memorial to be their favorite in Washington DC. 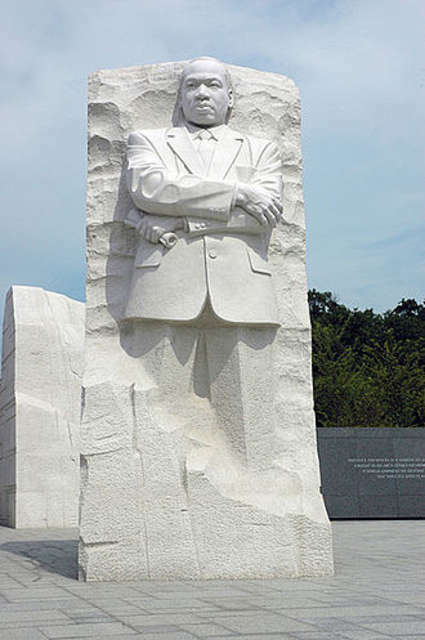 The MLK Memorial is the newest memorial on the National Mall, and the only memorial built to someone who was not a president. Dr. Martin Luther King, Jr. was the foremost civil rights leader in American history. The MLK Memorial overlooks the Tidal Basin and is the best location to see the Cherry Blossoms when they are in full bloom. Whether day or evening, the MLK Memorial is a beautiful new addition to the National Mall. The official name of this memorial is the Vietnam Veterans Memorial. 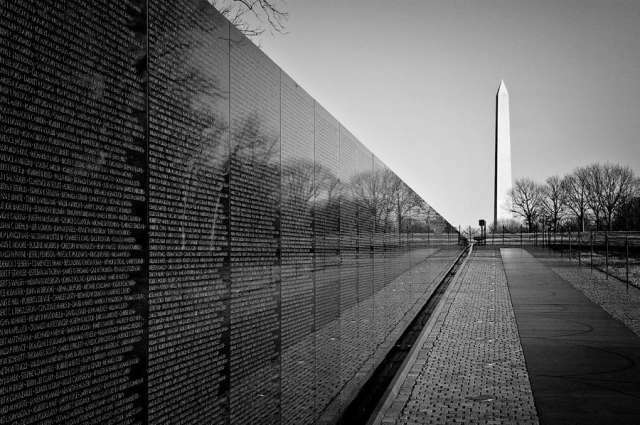 Finished in 1982, the Wall consists of a list of names of more than 58,000 American servicemen who died in Vietnam. The sheer quantity of names on the Wall cannot fail to impress anyone who visits. To this day, the Vietnam Memorial is visited by many people who wish to honor their loved ones or fallen comrades who died in Vietnam. There is a system to locate the names of anyone on the Wall. Many leave flowers or other objects in their honor. On Memorial Day weekend, the Vietnam War Memorial is the site of many public events and a huge gathering of war veterans comes here every year. During the day, you can see the memorial more clearly, but after dark the Vietnam Memorial takes on a much more somber aspect. The Vietnam Veterans Memorial is just northeast of the Lincoln Memorial. 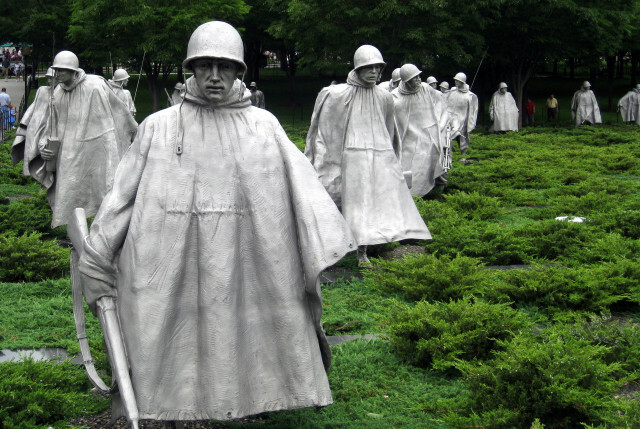 The Korean War Memorial honors the sacrifice of more than 36,000 American servicemen who died in the Korean War from1950-1953. The monument consists of 19 larger than life statues marching through a minefield through a freezing rain on a Korean mountainside. These statues reflect in a black granite wall. The 19 statues and the 19 reflections make 38 -- representative of the 38th Parallel that still divides South and North Korea even today. The monument is particularly poignant after dark, where the statues are lit up in a ghostly fashion. Korean War Memorial is just to the southeast of the Lincoln Memorial. Opened in 2004, the principle feature of the WWII Memorial is a black panel with 4048 stars. Each star represents 100 United States military deaths during the Second World War. There are 56 columns surrounding a large fountain. Each column represents a US state or territory that fought in WWII. There are also two archways -- Pacific and Atlantic. Underneath each archway is a listing of major battles fought in that theater of the war. The WWII Memorial is midway between the Washington Monument and the Lincoln Memorial. 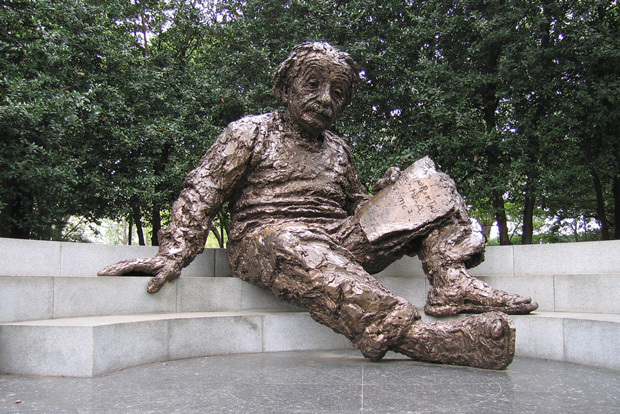 The Albert Einstein Memorial is just off the National Mall in front of the National Academy of Sciences, not far from the Vietnam Memorial and the Lincoln Memorial. It is an amazing sculpture by the great artist Robert Berks, and dedicated in 1979. This monument is often the favorite one for the kids since they are encouraged to climb onto the statue and sit or stand on Einstein's lap. You might notice that the nose has been rubbed shiny. Look for the secret echo by standing right at the North Star on the star map in front of the Einstein Memorial and talking toward the hand or the knee. 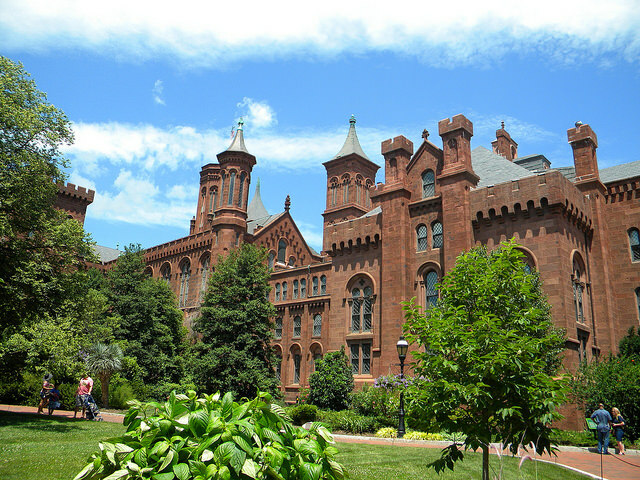 The Smithsonian Institution operates 20 different properties, almost all of them museums right here in Washington DC. Best of all, these museums are always free. Generally, opening hours are from 10:00 AM to 5:30 PM. A few of the larger museums have extended hours until 7:30 PM during some weekend days and during the summer. Following is a list of the major Smithsonian Museums in Washington DC. 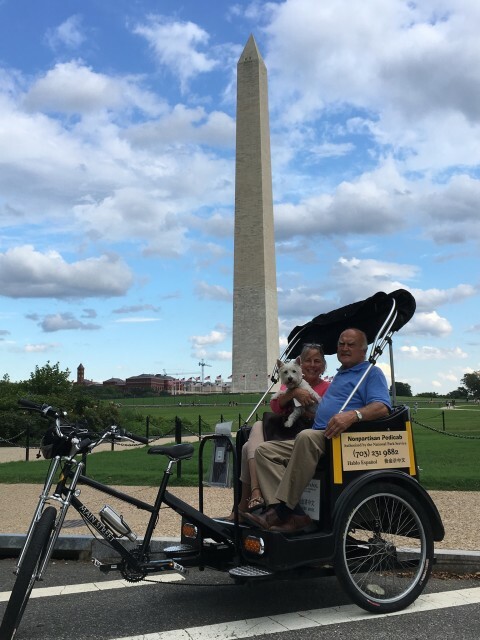 Most of these are right on the National Mall, and some of the others are in the downtown area and within walking distance of each other. The Smithsonian Zoo and the Smithsonian Anacostia Community Museum are both out of the downtown core. You will have to drive or take public transportation to get to either of them. 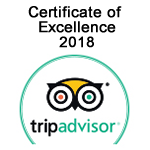 Dinosaurs, ice age mammals, modern mammals, the oceans, primitive man, geology exhibit with the Hope Diamond (largest blue diamond in the world), IMAX theater with films concerning natural history, a live butterfly room you can walk through, etc. They also have a cafeteria with food available. This museum can get very busy with school groups. Check the Smithsonian extended hours calendar to see if they are open late or have any special events. History of air travel and space exploration. Many historic planes hanging from the ceiling. Rockets on display. Capsule returning from the Apollo moon mission, Planetarium, IMAX theaters, flight simulator and virtual reality machine. They have a cafeteria. This is probably the busiest museum in Washington DC. Very busy with school groups. Try to go early. 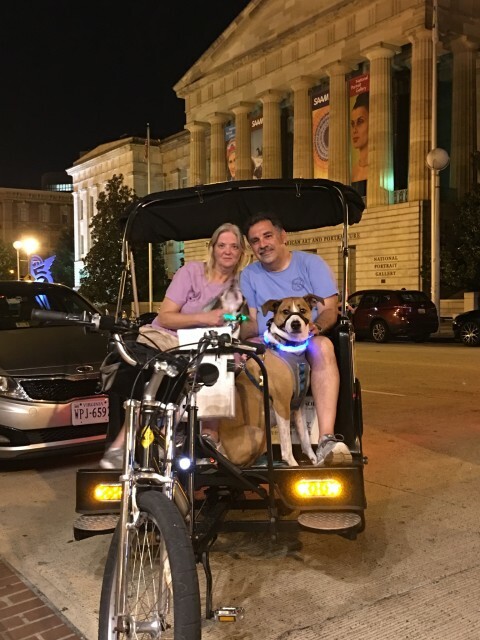 Check the Smithsonian extended hours calendar to see if they are open late or have any special events. They also have a very large annex with the space shuttle Discovery on display in Virginia by Dulles Airport. 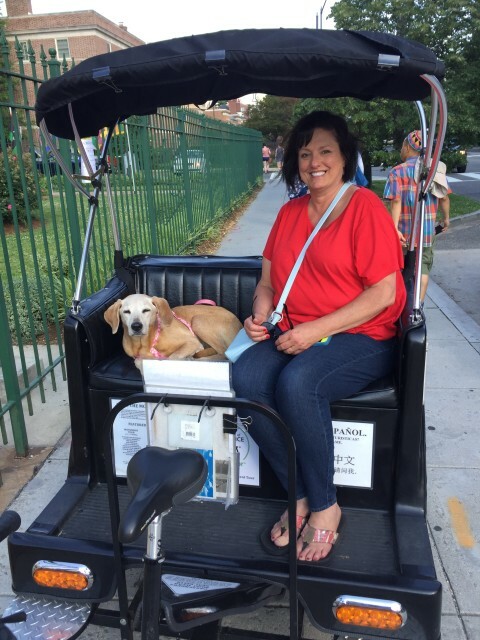 The annex is not in DC at all, but it is not far if you have your own vehicle. More information can be found at the Steven Udvar-Hazy Center website. American history and culture, vignettes on all of America's wars, Abraham Lincoln and George Washington memorabilia, the original Star Spangled Banner, old cars, trains buses, boats, a piece of the original Route 66, First Ladies' Inaugural gowns, popular culture memorabilia. They have a cafeteria. This museum is busy with school groups. 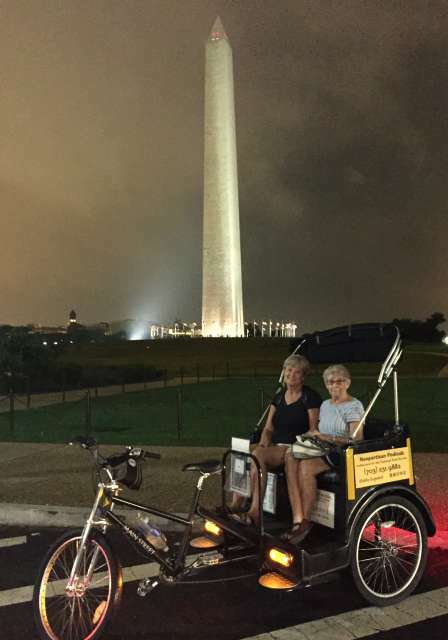 Check the Smithsonian extended hours calendar to see if they are open late or have any special events. A history of the African American experience, starting with slave trading in Africa and slavery in America. You then get taken through the Jim Crow period and the civil rights movement. The museum also has large displays of African American popular culture, sports and political achievements by prominent African Americans. There is an excellent soul food cafeteria. This museum is new (opened in 2016) and has been very busy. Pre-arranged free tickets have been necessary, but the Smithsonian Institution has been experimenting with walk up entry. The Smithsonian provides information on passes to the African American Museum. History and culture of the various tribes. They frequently have excellent special exhibits. A wonderful collection of traditional of firearms dating back to the 1500's. The museum has an excellent cafeteria specializing in Native American dishes. This is really two museums housed in a single large building. The Portrait Gallery has portraits of all the presidents and many famous Americans. The American Art Museum has a wonderful collection of American Art. There is a café. This museum stays open until 7:00 PM. American arts and crafts. The museum is known for its special exhibits. 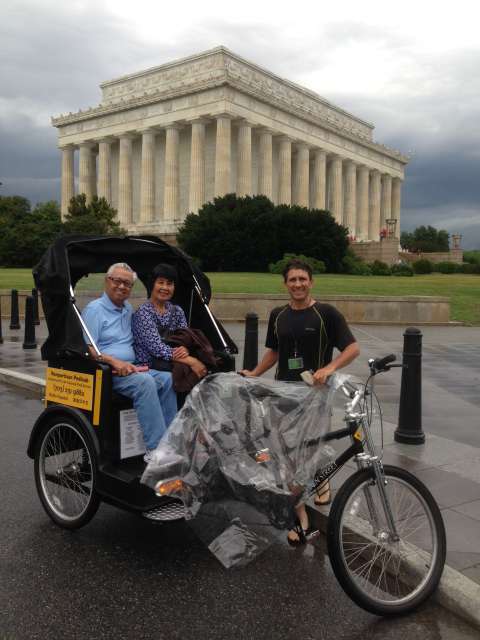 This museum is near to the North Lawn of the White House and Lafayette Park. Asian and American art. Connects with the Sackler Gallery and the African Art Museum underground. Asian art. Connects with the Freer Gallery and the African Art Museum underground. Not to be confused with the African American History and Culture Museum. This museum specializes in historical African art in gold and wood. They also have exhibits of modern African artists. Connected with the Freer Gallery and the Sackler Gallery underground. A history of post communications. Necessarily, this museum has many interesting exhibits about the western expansion of America. Great museum and hidden gem. Near Union Station. This is not a museum per se. The Castle contains the information center for all of the Smithsonian museums. They also have a cafeteria and a gift shop. There are sample exhibits from the other museums. A museum of modern art and sculpture. They have a very good sculpture garden facing the museum on the National Mall. One of the top art museums in the world. They specialize in Renaissance and 19th century European and American art as well as medieval religious art. There are two wings. The West Wing has the Renaissance, 19th century and medieval sections. The East Wing has modern art and sculpture. Even if you are not an art fanatic, this is a fantastic museum that will entrance you. A history of the Nazi genocide of the Jewish people and others before and during World War II. There are numerous Holocaust museums around the world. The one in Washington DC is probably the 2nd most important after Yad V'shem in Jerusalem This is a very somber museum and may not be appropriate for children. Entrance is free, but between March and August you should get your tickets online in advance. Click for Holocaust Museum online tickets. A museum of the media and the news. You can see the original front pages from major historical events, Pulitzer Prize photos from the last 75 years, and excellent special exhibits. There is a wonderful balcony overlooking the city. This museum is not free. If you don't feel like spending money to go inside, you can still see Today's Front Pages out front on the sidewalk -- one front page from every state in America that is changed daily, along with several front pages from international newspapers. Click for information on the Newseum. Numerous ancient and medieval bibles in many languages, fragments of the Dead Sea Scrolls, a 30 minute audio visual experience from the Old Testament, a recreation of the area around Nazareth 2000 years ago, and much more. The attached restaurant Manna is delicious. Entry to the museum is by donation. The Botanic Garden is on the western grounds of the US Capitol. It is divided into several rooms -- a jungle room, a desert room, a fern room, etc. Throughout, there are fantastic orchids, trees, and flowers. Admission is free. Truly fantastic. The White House is the residence of the US President. There are two spots to view it from the outside. Pennsylvania Avenue goes by the North Lawn at Lafayette Park. 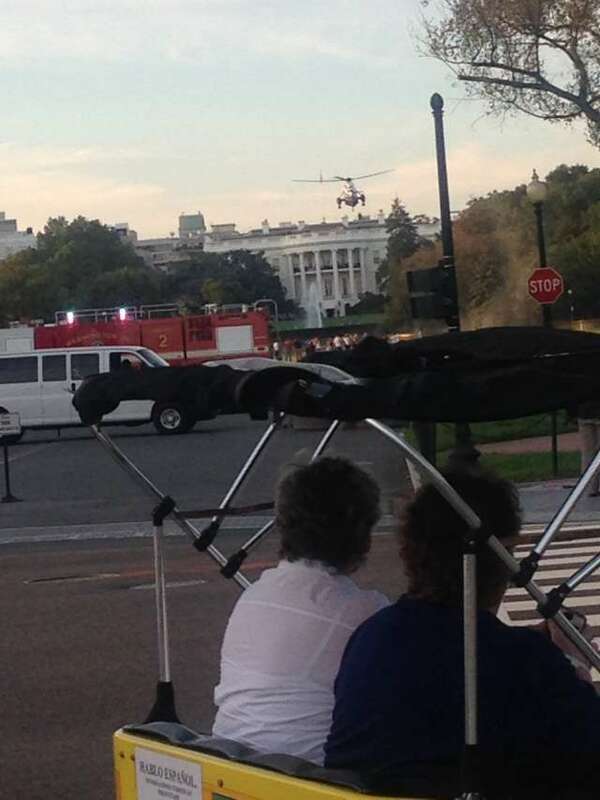 This is a great view of the White House from up close. The street is closed to vehicular traffic and has been turned into a nice pedestrian plaza. This is where Lafayette Park is. The South Lawn is the more well known view. Pedestrians can access this view from a sidewalk that borders the former E Street. E Street has been closed to vehicles and pedestrians, but just walk down the sidewalk for a great view. Visitors are squeezed into a small space here, so be prepared to wait your turn for a photo. Alternatively, a great view of the South Lawn of the White House can be had from Constitution Avenue as well, albeit you are further away. A view of the White House from above can be had from the POV Bar on the roof of the W Hotel on 15th Street. If you want a tour of the interior of the White House, you must apply well in advance through the office of your congressperson or senator. Their individual websites typically have a spot to click on for tours of the White House and US Capitol. Not everyone is approved. Don't take it personally if your visit is not accepted -- the problem is really too many people want to visit the White House. 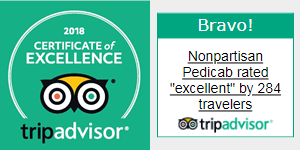 If you get approved, the visit is free. 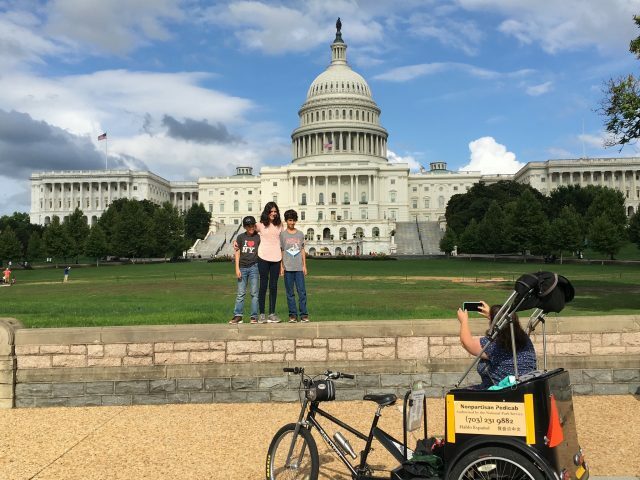 There are many good spots to view the US Capitol from the outside. On the west, the best view is by General Ulysses S Grant Memorial on 1st Street NW. To the east, there is a big wide plaza with fantastic views on 1st Street NE. If you walk around the entire building, you will have wonderful views on all sides. The interior of the building is fantastic. Access to the public is free. The US Capitol is open to the public from 8:30 AM to 4:30 PM, Monday - Saturday. You should really get a free advance pass from the US Capitol Visitors Center online before you go. If you don't have one, you will probably be looking at a long wait to get in. A better option is to book a tour through the office of your congressperson or senator. Frequently, they will set you up on a private tour with an intern. This tour will be more complete than the tour you will get from the Visitors Center. You can get breakfast or lunch at the congressional cafeteria. The Old Post Office Tower is a tall clocktower right in the center of town. It is the second tallest building in the city after the Washington Monument. There is an observation deck with large windows and a fantastic overview of the city from above. Admission is free. Last entry is 4:30 PM. Access is from 12th Street between Constitution and Pennsylvania Avenues. Note that the observation deck is operated by the National Park Service. The rest of the building has been renovated into the Trump International Hotel. The observation deck and the hotel are entirely separate entities. Whatever your personal political feelings are, don't let politics dissuade you from visiting the fantastic observation deck. Typically, there is no wait at all to go up to the observation deck. The hotel lobby is accessed from the other side of the building. This is an historic building, and the hotel lobby is truly magnificent. There are no special security procedures to enter the lobby of the hotel. 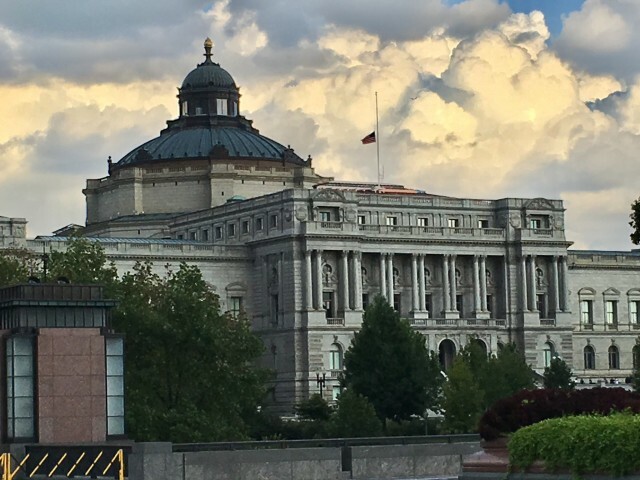 The Library of Congress is among the loveliest buildings in the city. Admission is free, and the Library is open to the public from 8:30 AM to 4:30 PM, Monday - Saturday. There are free guided tours of the building every hour, but you may also walk around on your own. The Library of Congress also has a number of permanent and temporary exhibits. The main historic building is called the Jefferson Building. Across the street in the Madison Building, there is a rooftop café with breakfast and lunch hours. 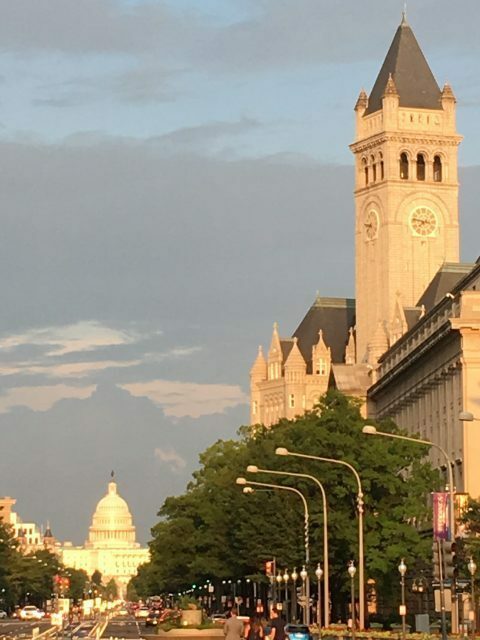 The Library of Congress, Supreme Court and the east plaza of the US Capitol are all nearby and definitely worth a visit if only to see them from the outside. The Supreme Court is right next to the Visitors Center for the US Capitol and the Library of Congress. You can visit the Supreme Court from 9:00 AM to 4:30 PM Monday to Friday. If you just want to tour the building, you can generally walk right in. Court sessions are also open to the public on a first come, first serve basis. For any cases that have attracted public attention, you should arrive early and wait in line. If you just want to see walk around the building, go ask the guard if you can walk in without waiting on line. A lunch café is open to visitors. The Kennedy Center is the performing arts center in Washington, DC. National Symphony Orchestra, ballet, opera, and even Broadway shows perform here. Even if you are not attending a show, a visit to the building is recommended. Free tours are available by the staff. 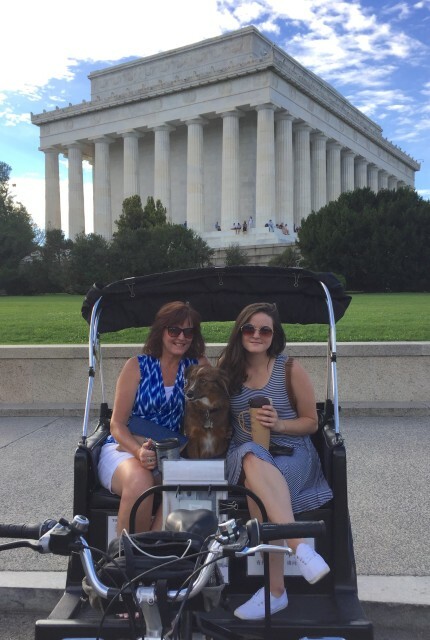 Go up to the rooftop for a beautiful view of the Potomac River and the Lincoln Memorial. Walk through the Hall of States to see giant flags of the 50 states hanging from the ceiling. Go into the Hall of Nations to see all the flags of the world hanging from the ceiling as well. The building is also decorated with artwork of all kinds. Every evening of the year at 6:00 PM, there is a free performance called the Millenium Stage in the rear lobby area overlooking the Potomac River. Many excellent artists come to perform. No tickets or reservations are required, nor do you need to dress up. A happy hour menu of drinks and snacks is available. The National Cathedral is an enormous non-denominational church that is open both to sightseers and to those who come to worship. Although it is not right down, you can easily get here by taxi. 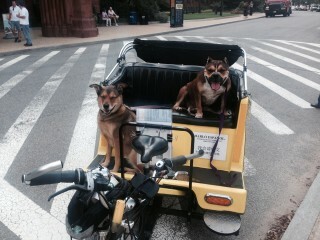 You might consider walking up Massachusetts Avenue from DuPont Circle. 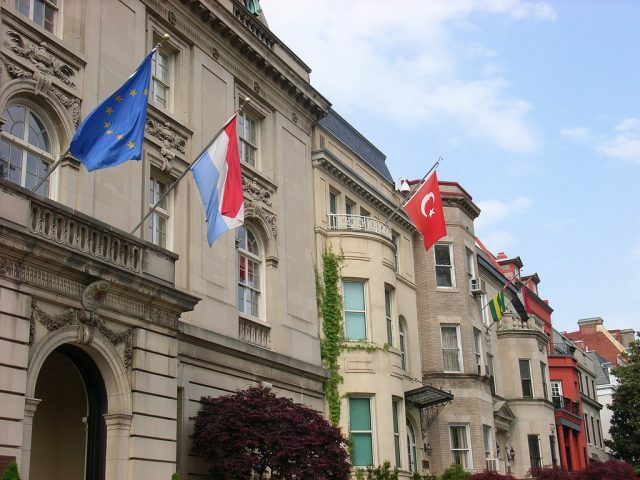 This section of Massachusetts Avenue is known as Embassy Row. Architecturally, the National Cathedral is very impressive, with much artwork and many gardens. If you are here as a tourist to see the building, there is an admission of $12 for an adult, and $8 for a child. If you come to worship, then admission is free. Sunday services are free to all. Check the National Cathedral website for details. 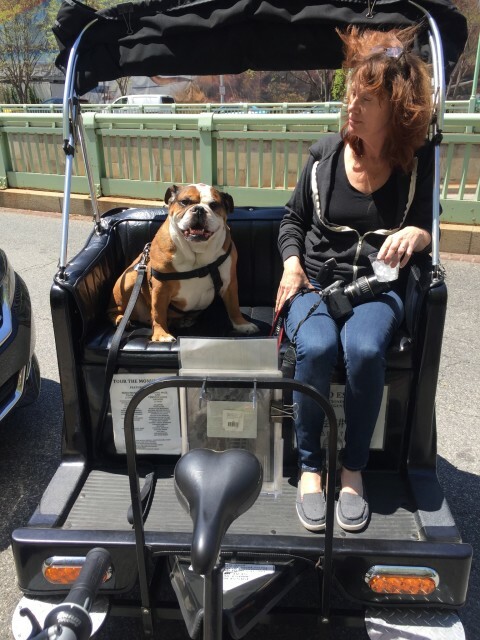 Georgetown is a very desirable and exclusive residential neighborhood with a long history -- it actually predates Washington DC. There are three sections to visit. On the waterfront, you can find many places to eat overlooking the Potomac River. The commercial area is along M Street between 29th and 35th Streets and also along Wisconsin Avenue. You will find many boutiques, hotels and eateries in this area. North of M Street is a quiet, tree-lined residential area. The homes are very expensive here. Walk along N and O Streets and take in some of the ambience. O Street ends at Georgetown University, which is very impressive. Embassy Row runs west from Massachusetts Avenue up to the National Cathedral. You can see over 100 embassies from all over the world just in this area. Many of them are housed in elegant townhouses dating back to the late 19th and early 20th centuries. Spot the flags outfront. If you don't recognize each of the flags, don't worry. Each of the embassies has a plaque to identify it with the name of the country. There are also many statues of foreign leaders placed here. You can visit the Philips Gallery Museum, or the Anderson House (an old mansion) on the way. The Islamic Center, the first mosque in Washington DC, is also open to visitors. About halfway up to National Cathedral, you will pass by the United States Naval Observatory. This is the official residence of the Vice President. The Master Clock is right out front, displaying the official hour from which we all set our watches. DuPont Cicle is a very well-to-do neighborhood close to everything. You will find very nice tree-lined residential streets full of beautiful townhouses. There are also a large number of foreign embassies in the area. DuPont Circle has many eating establishments and fine restaurants. Connecticut Avenue is the commercial hub of the area. 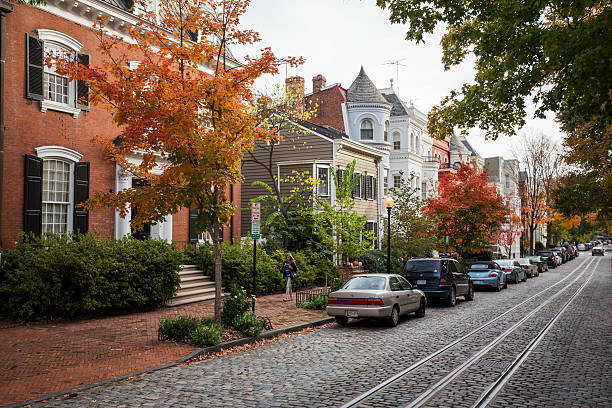 Capitol Hill is a fine neighborhood right behind the US Capitol with many tree-lined streets and historic townhouses. Eastern Market is on Capitol Hill only a few blocks from the US Capitol. You can get find food products, meats, vegetable, fruits, etc. Quite a number of restaurants are right nearby. On the weekends, the streets surrounding Eastern Market have hundreds of stalls displaying handicrafts and artwork.